Over the last few weeks, my family has gotten some really bad news. It was news that made me angry and depressed all at the same time. I felt like curling up and shutting out everything. I wasn’t even looking forward to going trick-or-treating with my kids because I just didn’t have the energy to do it after all the bad news. 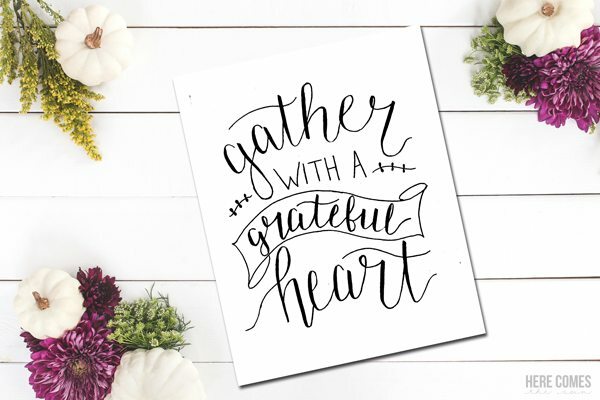 But I realized that I needed to get myself together and be grateful for the things that I do have which is why I am sharing this Hand Lettered Thanksgiving Print with you today. I’ve been working on my hand lettering this year and I finally feel like I’ve gotten the technique down somewhat. I’ve been helped along the way by my friends Dawn at Dawn Nicole Designs and Amy at One Artsy Mama. They have wonderful resources on their blogs all about hand lettering. Over the past year, I have created hand lettered gift tags, chalkboard art, ornaments, coffee mugs and have even digitized my hand lettering. The best thing that I have learned about hand lettering is to sketch your design in pencil first. Many people don’t need to sketch and when I was first learning, I thought that I didn’t need to sketch either. This just led to a lot of frustration. I always sketch everything so I can line things up . After sketching, I go over my pencil lines with a brush pen. Heavy on the downstrokes of the letters and light on the upstrokes. My favorite brush pens are currently the Tombow Dual Brush Pens. I love them because they have a brush tip and then a smaller, firmer tip for detailed lines. The biggest tip that I can give any beginner (and I still consider myself a beginner) is to be patient and go slow. You can download the 8×10 Hand Lettered Thanksgiving Print here. Please note it is for personal use only. It may not be sold or redistributed. 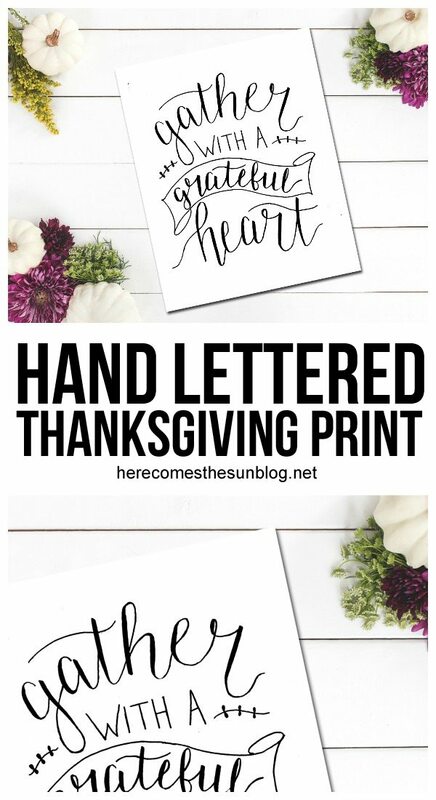 I also offer some hand lettered printables are part of my subscriber only perks so be sure to sign up for my email list to receive a new free printable each month. They are given to email subscribers only and not available anywhere else on the blog.